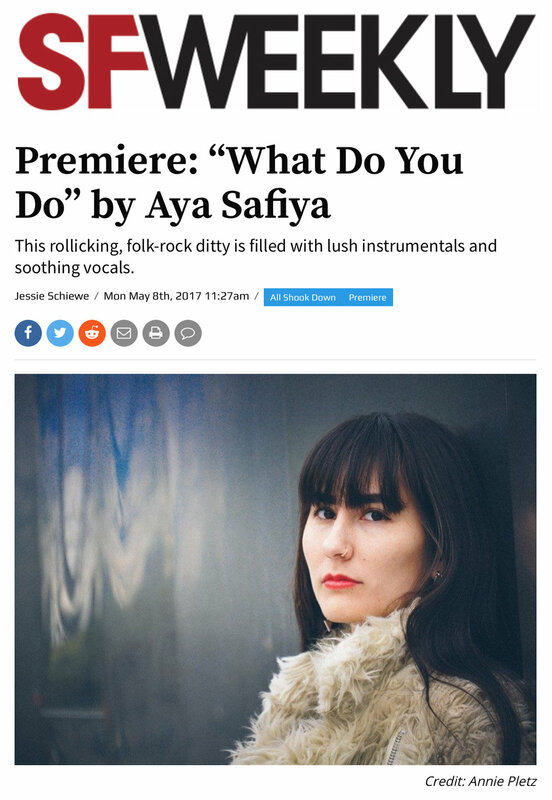 Aya Safiya in the press: featured on Atwood Magazine, DopeCauseWeSaid, East Bay Express, Opal Music Blog, & SF Weekly. Aya Safiya, based in Boston and the San Francisco Bay Area, is a Pop singer songwriter whose style is Indie-pop and Electro-folk. Aya Safiya’s self-titled debut EP offers the kind of fresh messages and rich sounds that will ultimately help push music forward. Independently released last Friday, 9/14/2018, the five-track Aya Safiya EP is more than an introduction to the Boston by-way-of Bay Area singer, songwriter, and violinist: It’s an assertion of powerful emotions and meaningful experiences, reflections on life, and aspirations for a better world. Safiya’s sound is engaging and catchy, yet it defies standard categorization: Nuances of electro-folk and indie pop bring to the fore artists like Tennis or HAIM, yet such comparisons are merely for perspective: Despite coming of age in a seemingly fully-saturated market, the artist has (with the help of producer Tano Brock) crafted a standout sonic persona. With her new EP, the East Bay-bred singer-songwriter doesn't completely leave her roots behind. Aya Safiya is a traditional Greek musician perched on the cusp of something new. She's a violinist and vocalist trained in North African, flamenco, Balkan, Greek, and Turkish techniques, but if you ask her, you won't find any evidence of her world music background on her self-titled debut EP. That's because for the first time, Safiya is making pop music. This rollicking, folk-rock ditty is filled with lush instrumentals and soothing vocals. Most people have had crushes in their lives. (I know I certainly have.) And sometimes, those crushes can be problematic, say, if the dude in question is your best friend’s boyfriend or if the girl you like is your sister’s friend.